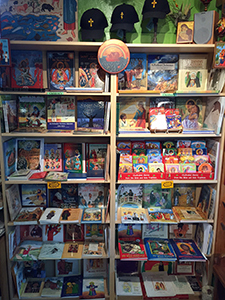 Awakenings is an Orthodox Christian bookstore located in downtown Felton. It is owned and operated by Saint Lawrence Orthodox Christian Church. 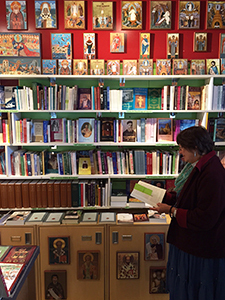 We have over 1700 titles in stock of books and pamphlets, all in English, on the Orthodox Church; its history, beliefs, services. We carry many spiritually profitable titles by authors of Orthodox Church and on its teachings, lives of the saints and elders of the Orthodox Faith. There are also various writings on the Western “Christian” churches, their histories and their doctrine. Awakenings caries a variety of prayer ropes, incense, various candles and has a large selection of children’s books. Our extremly knowledgeable and helpful staff will help you find what you need. We also have a large selection of over 400 icons in stock, including over 100 icons by one of the priests of our parish, Fr. Luke Dingman, a prolific Iconographer of many years. Unfortunately, at this point in time we do not have a website with an online storefront, but would be happy to help you with any questions about the products we offer. If you are ever in Felton, please come by for a visit!